Many of us wear clothing to feel and look good. Some of us wear certain garments for traditional or ceremonial purposes. There are meanings ascribed to the colors and symbols embroidered, dyed, woven, and/or printed on to many fashions. Today most of us wear what we like, cause we like it. It’s fun and educational to learn the meanings behind many of the colors and symbols used in today’s clothing worldwide! I wrote about the different meanings of Kente in the blog “Kente Kente Kente” One of House of Rubi most popular and fan favorite item, is the Rainbow Kente Corset. The House of Rubi Rainbow Kente Corset! Curiosity led me to research the symbols on this corset’s fabric print; here are my findings!! A deep maroon/magenta is the predominant color through out this corset. According to today’s color psychology, the color magenta represents emotional balance and universal harmony. Magenta is a blend of red and violet, hence it contains the passionate powerful energy associated with red, yet that energy is subdued due to violet’s calming and quiet energy. This creates a harmonious balance between energies. Kente cloth originated in West Africa and is identified with the Akan people and the Asante Kingdom. Today, the most recognizable Kente cloth have predominantly yellow and orange colors. Yet Kente comes in many colors and every color has a meaning. The House of Rubi Rainbow corset has Maroon/Magenta, pink, blue, green, yellow, stripes and oval shaped patterns. Model stuns in House of Rubi Kente Corset!! Click this image to order and find out more about the House of Rubi Rainbow Kente corset!! Maroon-represents mother earth and healing. 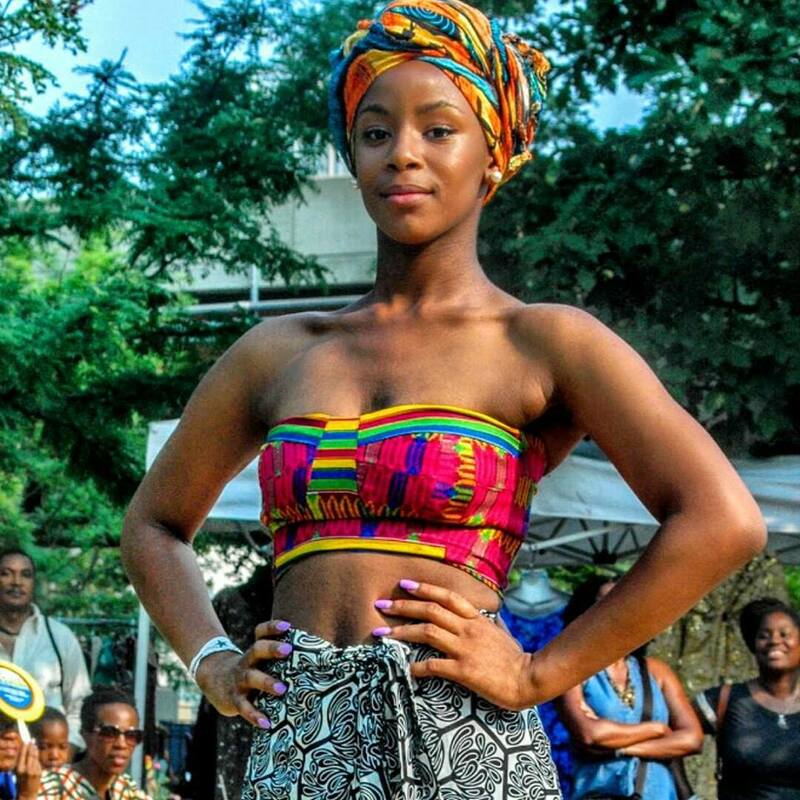 Model exuding confidence and feminity while showcasing the House of Rubi Rainbow Kente Corset! Click this image to order and find out more about the House of Rubi Rainbow Kente corset!! Most Kente fabrics have triangles, squares and circles woven into the fabric design. There is a difference between the types of Kente. The traditional Kente fabric features designs that are woven into the fabric. Today’s commercialized Kente design are printed onto the surface of a cotton and/or cotton blend fabric. Sketching and stylings for House of Rubi corsets! Click this image to order and find out more about the House of Rubi Rainbow Kente corset!! Check out these articles to find out more about color phsychology, Kente colors, and symbol meanings! Follow House of Rubi to find afro-chic and other cultural inspired fashions, learn about world design trends cultural traditions, and keep updated on the brand!! This entry was posted in New York City-World. Bookmark the permalink.